Roll out your tart dough into a 14-inch circle approximately 1/8-inch thick. Place dough on a metal baking sheet lined with parchment paper and set in the refrigerator to chill. 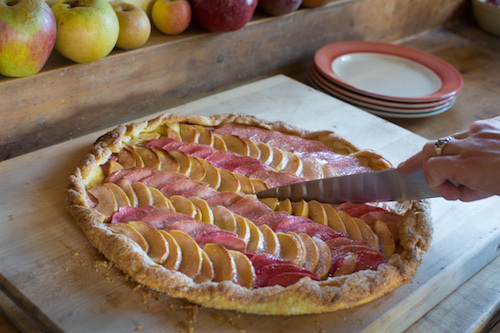 I like to use a nice, firm and tart baking apples- for this tart I used Spitzenburg & Ruby Red. Slice your apples into 1/4” slices. Brush the edge of the dough with melted butter and drizzle the remainder of the butter over the apple and quince slices. The amount of sugar needed depends upon the tartness of the apples ou are using. A good way to test is to add the smallest amount needed and taste an apple slice half way through baking and add more sugar as needed. Sprinkle the buttered edge of dough with a bit of sugar - this will caramelize as it bakes and gives the crust a nice sweet crunch. Place in the oven and bake until the crust on the edges and bottom are baked through and golden – about 40-50 minutes. Cool on a rack. You can glaze make a glaze from the cores and peels by cooking them until they’re soft with a bit of water, straining our the peels and cores and cooking the apple liquid down with a bit of sugar to taste. Serve warm or at room temperature with sweetened cream, crème fraiche, or a la mode. Let cold butter soften slightly. Before mixing into flour mixture, test by pressing your finger on one of the pieces. It should press easily, but remain cold and not leave butter on your finger. If the butter is hard to press and cracks then it is too cold and you should let it soften further. If it is room temperature and leaves butter on your finger when you press it, it is too soft and should be put back into the refrigerator for a few minutes until it is the correct temperature. Once butter is the correct temperature, add the pieces to the bowl and toss the flour mixture over them to coat. When they are all coated, start pressing them with your thumb and forefinger one by one to flatten them. When all the pieces of butter are flattened in your bowl of flour, start drizzling ¼ cup of the ice water into the bowl. Mix dough by hand with your fingers spread and curved slightly forming a “claw” using it to rake the dough and turn up the dry mix from the bottom to the top to evenly incorporate the water. Continue mixing this way until the dough starts to come together breaking up any larger clumps as you go. Resist the urge to squeeze or press the dough together since this will overwork the dough and make it tough. After mixing a bit, if there are still dry bits, drizzle a bit more water (1 Tablespoon at a time) over the dough. You should not worry if you don’t use up all the water, if the dough is moist and most of the dry bits are gone then it is probably enough water. What we have found is that the moisture content of the butter varies depending on the time of the year, so the amount of water we need for the dough varies as well. Give your dough a final “rake” and break apart any large clumps. The texture of the dough should look “ropy” and a few dry patches are okay these will get worked out during the last steps. Divide your dough in half and roll each piece gently into a rough ball placing each on a piece of plastic wrap. As you wrap the dough into a disk, knead the dough gently to incorporate any dry bits or butter chunks. You don’t want either in your final dough as they will cause the dough to produce a hole in your tart as it bakes. Smooth the dough into a disk and check the surface – it should have a slightly marbled appearance. If you see any dry bits or butter chunks, knead gently again to incorporate. Place your wrapped disks of dough in the refrigerator for at least 1 hour before rolling out. When rolling out, make sure dough is malleable, but still cold. When ready unwrap your dough, dust your counter and dough disk lightly with flour, and roll out to a 14-inch circle about 1/8 inch thick. Dust off any excess flour from both sides of dough with a dry pastry brush and place circle on a baking sheet lined with parchment paper. Chill dough circle for 30 minutes before assembling your tart. Dough can be rolled and stored in freezer up to 3 days in advance. Dough disks can be stored in freezer wrapped in plastic for up to one month. This recipe makes 20 ounces of dough which is enough for two free form tarts.